It hasn't been officially called, but do you think we're in a recession? NEW YORK (CNNMoney.com) -- PNC announced Friday it would acquire regional bank National City in a deal worth about $5.6 billion. The sale, which values National City at $2.23 per share, would create the nation's fifth-largest U.S. bank with $180 billion in deposits. PNC is exchanging $5.2 billion in stock and paying an additional $384 million in cash for National City. "We believe this strategic combination will continue PNC's efforts to build capital strength and shareholder value," said James Rohr, PNC's chairman and CEO in a statement. Making the announcement before Friday's opening bell, PNC said it would also get a capital injection from the government by selling $7.7 billion worth of preferred stock and related warrants as part of a federal program aimed at propping up the nation's banking system. "We are pleased the Treasury selected us," Rohr said in a conference call with investors, adding that it won government approval late Thursday. The two firms said the combined company would be headquartered in PNC's hometown of Pittsburgh, while the merger would broaden PNC's footprint in other key parts of the upper Midwest such as Indiana, Michigan and National City's home state of Ohio. The deal, which is expected to close by year end, concludes what has been a painful period for National City. Shares of Cleveland-based National City have been hit hard over the past year as investors speculated about the bank's health due to its exposure to the deteriorating U.S. mortgage market. That was apparent as recently as this week when National City reported a $729 million third-quarter loss and detailed plans to eliminate 4,000 positions, or 14% of its workforce, over the next three years. As a result of the merger, PNC said Friday that it estimated it will write down nearly 18% of National City's loan portfolio going forward. That's significantly larger than the loss forecasts that National City executives provided just days earlier. The merger represents the latest shakeup in the U.S. banking industry. Over the past two months, major institutions such as Lehman Brothers and Washington Mutual have failed, while others, including Merrill Lynch and Wachovia, have rushed into the arms of suitors in order to survive. It is widely believed that there will be more bank deals in the months ahead. Some analysts believe that more banks will try and tap the government's investment program to get capital on the cheap and use some of that money to buy weaker rivals. But for now, some of the nation's largest banks, like JPMorgan Chase and Wells Fargo, may be done shopping for now, said Stuart Gunn, a director at the Chicago-based management consulting firm Bridge Strategy Group. That's because these banks will soon come up against government limits regarding how much of the nation's deposits they can own. Gunn added that some smaller regional banks may need to merge with others in order to survive, however. Still, Friday's trading session was quite painful for many banks, as well as the broader market, due to global recession fears. Other than PNC (PNC, Fortune 500), whose shares gained more than 3% Friday on the news, many bank stocks were lower, including National City (NCC, Fortune 500) which plummeted about 25%. While the broader market sank amid fears of a global recession, stocks in other major banks plummeted Friday, including Citigroup (C, Fortune 500), Bank of America (BAC, Fortune 500) and JPMorgan Chase (JPM, Fortune 500), as well as investment banks Goldman Sachs (GS, Fortune 500) and Morgan Stanley (MS, Fortune 500). 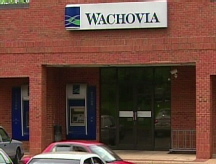 Shares of other regional banks, including Birmingham, Ala.-based Regions Financial (RF, Fortune 500) and SunTrust (STI, Fortune 500) also fell Friday, despite a report by the Washington Post that said the two could be among a group of nearly two dozen regional banks given billions in capital from the U.S. government in exchange for equity stakes as early as Friday afternoon. In addition to PNC, the Treasury Department has already said it would invest $125 billion in nine other major banks and was looking to invest up to $250 billion overall in bank stocks. Government officials told CNN Friday that talks were ongoing with other banks and that the amount of capital allocated towards the group could exceed the $250 billion it expected to spend originally. And some regional banks did buck the downward trend though, such as BB&T (BBT, Fortune 500) and US Bancorp (USB, Fortune 500). Raymond James analyst Michael Rose said BB&T could be a takeout target given how well the company has done during the credit crunch compared to many of its peers.